Responding to last week's controversial decision by Belfast City Council to hold a 'civic reception' and military parade in November for returning troops from Iraq and Afghanistan. "This display and glorification of state terrorism at both home and abroad of rampant militarism, of a deeply unpopular and brutal occupation resulting in the deaths of hundreds of thousands of innocent civilians should be vigorously opposed and prevented from taking place." In addition as anti-militarists, “this is a futile attempt to gloss over growing discontent within the army whenever morale and recruitment is at an all time low. We would call upon serving soldiers to disobey orders and refuse to be cannon fodder in the interests of imperialism, careerist politicians and generals." No War, but the Class War! The Workers Solidarity Movement is an anarchist organisation in Ireland set up in 1984. 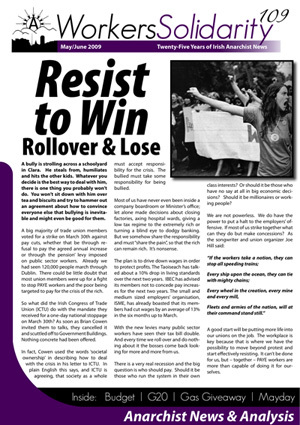 WSM publishes the paper Workers Solidarity and the magazine Red and Black Revolution. The WSM has been involved in a wide range of struggles in Ireland: its members are involved in Irish trade unions; have fought for abortion rights and against the perceived growth of racism in Ireland and have also been involved in campaigns in support of workers from countries as far apart as Nepal, Peru, Mexico and South Africa. In recent years the better known struggles the WSM were involved in included the 2003 March 1st action against US war planes in Shannon, the 2003 Anti-Bin Tax Campaign in Dublin and the 2004 EU Mayday protests also in Dublin as well as campaigning against the citizenship referendum in 2004. WSM members are currently involved in the Shell to Sea campaign. They are also involved in the Cork Autonomous Zone, Seomra Spraoi, the Terence Wheelock Campaign,Indymedia Ireland, the Independent Workers Union of Ireland, Anti-War Ireland and the anti-Raytheon campaign in Derry.